In which I leave Microsoft. Over the past year I’ve been doing quite of bit of thinking. Nothing specific, nothing groundbreaking. Just plain old thinking. I turn 40 this year. Despite the wonderful ability in Microsoft to change careers pretty dramatically inside the company, I’ve been there nearly 18 years and it’s the only world I’ve really ever known. I feel too strangely comfortable, and too strangely tied. So over the past several weeks I’ve made the decision to resign and have been working with my management for an orderly transition. My last day will be February 15th. On the 16th, I’m going to head down to Dallas to visit my family. Then I’m off to JocoCruiseCrazy! I have no other plans beyond that. I’m a free agent! One with 18 years of experience in technology, public and written communications, and 5 years spent deep in the entertainment business. If you have something you think I’d be good at, by all means feel free to contact me at Stepto at stepto.com. Or you can buy my book or the audio version of my book via the links to the left (shameless plug). Nothing will change with regards to my Twitter or blog, I plan to return to doing a lot more writing here on new topics and video game thoughts. And I’ll continue to be a super tweeting twitter guy who tweets a lot, again keeping a video game oriented focus. For anyone wondering, I want to make sure I am clear: This is a positive thing. I have nothing but confidence in the future of Microsoft and specifically Xbox and Xbox LIVE. I have enormous gratitude for my time there. I want to finish my next book, and explore other opportunities. So there it is. I have no idea what the future holds, for the first time in my life. This ought to be interesting! In the time honored tradition of Microsoft employees who make the decision to leave, I just sent my farewell email. In another tradition, Microsoft doesn’t comment on specific personnel changes and I’m going to be honoring that. I’ll be declining any media requests for now since until the 15th I’m still a Microsoft employee, and after that I plan to be enjoying rum drinks and being disconnected from everything for a while. I’ll be back online and in Seattle on the 28th. On a warm Dallas day April 11th, 1994, I grabbed my keys and wallet and headed for the front door of my apartment. I stopped short when I realized I was going to need my building access badge that I had just been given that previous Friday. I walked into my bedroom and grabbed the badge, making a mental note to remember to keep it with my wallet at night so I wouldn’t forget it in the morning. It was my first full day at Microsoft. I was 21. Since that day (very nearly without exception) I’ve carried a Microsoft badge with me basically where ever I went. That April day I was a contractor with Microsoft, A-Stepto. The following January I was hired as a Microsoft FTE and issued a new email name, SToulouse. Because everyone had already started calling me Stepto, my manager had them change it to Stepto. It stuck. I wrote in my book about some of the amazing things I’ve been a part of at this company. Shipping Windows 95. Traveling the world in the training organization teaching support engineers about upcoming technologies. Being a security PM and spokesperson for the entire company on security issues. Getting to play a part in the success of Xbox, Xbox LIVE, and Kinect. I can’t possibly conceive of the good fortune, challenges, and rewards I’ve gotten from almost 18 years at Microsoft happening to me anywhere else. But I’m going to go see just to make sure. February 15th 2012 will be my last day at Microsoft. My reasons for leaving are complex and personal, but the parting could not be more amicable. I continue to believe this place makes great technology, and I am absolutely thrilled for the future of Xbox and Xbox LIVE. What are my plans? I don’t have any! That’s both scary and exciting. Well, it’s also a bit untrue. The day after I leave I’m headed out to join my Internet friends on JoCoCruiseCrazy in the Caribbean. And I’m nearly finished with my second book, on a topic unrelated to Microsoft. But after that I don’t have anything lined up. I’m going to see what happens. After almost 18 years There’s too many people to thank. First and foremost CSS for my start at Microsoft in the Las Colinas office. TwC for my wonderful time there working at the Microsoft Security Response Center. I’d like to thank Xbox, my team and the entire staff of my wonderful enforcers who work so tirelessly to help protect the Xbox LIVE service. It’s been an incredible privilege and honor to work with people so friendly, dedicated, and nearly impervious to naughty Internet slang. I’d like to thank Microsoft for an unbelievable set of opportunities, an incredible education that they paid *me* to obtain, and for the opportunity to be neck deep for five years in my first love: video games. My leaving’s not tied to any event or thing, so I’m not out the door just yet! Please feel free to drop by or chat. 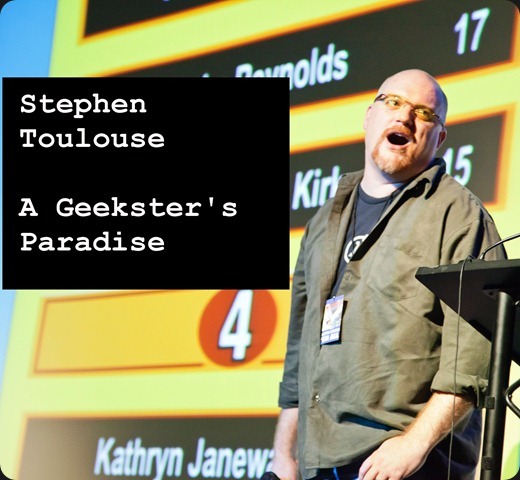 After the 15th you can reach me at Stepto@stepto.com. But be aware I probably won’t be able to answer you until I arrive back in Seattle on the 28th because I’ve always been the guy that checks my email on the beach and I’m not going to be that guy anymore. Trustworthy Computing Ten Years On. I wish you good luck my friend! The podcast will not be the same without you. We’ll miss you! I’m happy for Stepto, but why not make it 20 years, dude? Any goog luck on your new adventures. It’s a big step. You’ll be awesome in whatever you do. Thank you so much for everything you’ve done (and everything you’ve shared). Best wishes in the undiscovered country. Xbox will miss you, but I’ll see you at the dog park :D.
You’re planning to have him as a guest on the show later on? Kidding. Best of luck to you in your future whatchamacallits! You’ll be missed sir. I assume this means we will not be hearing your charm on the Major Nelson podcast, either? I wish you all the best, and have fun! people and looking after the community you will be missed. I hope you find what you are looking for! It was awesome and an honor working with you. Thank you for being a great leader and friend. You’ve done a fantastic job. I’ll surely keep up with your work in the future. I was first introduced to you on Larry’s podcast and it will not be the same without you. You represented your place of employment better than most people I’ve ever seen. You also let complete strangers into your life through the podcast and recognized that. I felt for you and your family while you were going through the tough times with your dogs and wish you the best of luck in your future endeavors. Good luck, Stepto! People actually need to Bing that quote? Best of luck to you. Sometimes the greatest adventures we have are the ones we don’t plan. My thoughts exactly, hopefully everyone knows where that quote is from. Stepto, my wife and I met you at the w00tstock performance in Dallas a couple years ago (we drove from our home in Texarkana to Dallas). At that time, I had only heard you on Major Nelson’s podcast and had just started to follow you on Twitter. I wanted to offer my gratitude as well as her’s for the entertainment you have provided us over the past few years. I know your decision to leave Microsoft didn’t come lightly, but I wanted to post on our behalf’s and wish you well in your future endeavors. hey can you unban my account before you leave? Wow! Huge and amazing. Wishing you a wild ride and soft landing for the next adventure. I am going to miss hearing you on the podcast each week. Best of luck to you wherever you end up! Major’s Podcast is going to very empty without you and you will be missed by all the regular listeners. I hope you have huge success in your future endeavors and never forget that you and the team brought so much joy to us. My cynicism says that you were laid off or managed out in MS’s continuing effort to get rid of the old-timers. I hope this isn’t the case and that you were indeed master of your destiny. Thank you for making XBL a better place to game and being the best ban hammer evah! Good luck on whatever the future holds. We’ll miss ya for sure! For years, stepto = XBL banhammer. Going to miss the book of enforcement readings. I hope you get to move on to something you really want to do. I am also on the cruise and if our paths happen to cross, I’d love to offer you a Scotch (of the single malt variety). And thank you very much for showing via web, podcast and every possible media the importance of being respectful to each other not only in xBox Live but everywhere. I am only going to be selfish for one second. We don’t want you to go! The podcast won’t be the same without you. Please don’t go! On a more realistic note, I hope, for your safety and the safety of your family, those asshats threatening you because you banned them aren’t the reason for your departure, although I’m afraid it may be partly to blame. If so, good for you. Protecting your family is the most important thing. Venturing off to the unknown is also a fun thing, so regardless of the reasons, I know you’ll have a great time with whatever comes your way. Those of us loyal followers will stay with you here on stepto.com, and we expect you to continue to entertain us! wishing you all the best and hope to keep on hearing from you. You created a standard on Xbox Live (be Excellent) and have been an inspiration in many ways. I can’t wait to hear what you will do next but keep in touch with your readers ;). The podcast won’t be the same without you. I’ve only gotten to know you over the last year through the podcast (I came to this party late). In no way slighting the others, I’ve always identified with you the most. I love your website. I lost my dog of 14 years last February, so I even feel like we went through that together. Enjoy this next part of your life. Everything that happens is in perfect in order. Congratulations on the next phase of your life, whatever you decide it to be. Wow, this is one bitter sweet post I am sure. I gotta admit I will miss you on the podcast and hearing about your panels and dealings with the press. Best of luck with your next venture, it feels like part of the Xbox family will be missing now, I can only imagine how your colleagues will feel. Been great having you as part of the Xbox gang – gonna be strange knowing you’re gone! Good travels – go walk the earth. Wow, It’s hard to hear that you’re moving, I’ve been listening to the Major Nelson Podcast since 2006ish when i was a kid and I’ve heard every podcast you’ve been on so its kinda sad to see you leave that part of you’re life. I dont think its a bitter sweet end, You clearly have a lot of love for Microsoft and it shows in your book, I actually read your book and I really enjoyed it. It kinda confirmed for me that one day, I would love to work for Microsoft and that’s my aim after I leave University and I feel like you are part of the reason. Thanks for all your hard work at Microsoft and I hope your new venture out in to the world of Tech will fulfill your current desires. Hopefully we’ll read more about your new ventures on here. any chance you can unban my permanently banned xbl account before you leave? I’m just in shock! Good luck with the future and we know you’ll be awesome in the end. That’s a hard thing to do, but I bet you’ll do something great after! I wasn’t aware of who you were or what you did until Zite tossed me your article – but I wish you all the best. I was an early adoptee of XBL back on the original Xbox and continued that into this generation, until I finally decided to stop paying for a service the competition was providing free of charge. As well, my (3rd) refurbished Xbox 360 that Microsoft sent me sounds like a helicopter with Tourette’s, so I rarely turn it on. But it sounds like you were a valued employee with a wide gamer fan base, and it’s always exciting to head off into the distance at the height of your career. Onward and upward! best wishes to you, stepto!! Fantastic. I love these sort of blog posts. Good luck with everything — enjoy that vacation! Thank you for everything you have done for this community. We will miss you. Do not stand at my gamertag and weep,I am not there; I do not sleep.I am a thousand gamerscore,I am the melee kill on snow,I am the sun on skyrim grain,I am the gentle blood rayne.When you awaken in the morning’s hushI am the swift uplifting rushOf Alam Wake birds in circling flight.I am the soft star-shine at night.Do not stand at my gsmer card and cry,I am not there; I did not respawn then die. Many thanks for the hours of entertainment you helped provide. I look forward to reading your next book. Good luck. Good luck StepTo, thanks for all you have done with MS and XBL. You bee a champion at promoting XBL and how it should be. It was a honor meeting you at PAX 2011 in Seatle. 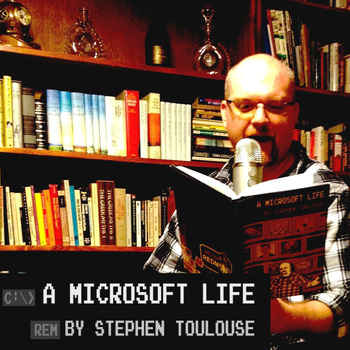 Pingback: Microsoft’s Stephen Toulouse Resigning | Rocket Punch! Just wanted to say thanks for everything in a few more than 140 characters. I was later to the party than most, only learning who you were when I happened to sit in on your enforcement panel at PAX East last year (always being curious, working in email anti-abuse, what such matters are like in non-email fields). The experience was informative and hilarious and, afterward, I started following you on Twitter and listening to Major Nelson’s podcast (the first podcast I ever subscribed to, having completely ignored the medium up to that point). So, thank you. As an Xbox Live gamer, thank you for sharing the inner workings of Microsoft’s banhammer with us. As a dog lover, thank you for letting us into your personal life and sharing your ordeals with Remington and the recent joys of bringing Eowyn into your family. Overall, thank you for being an inspiring (yes, inspiring) force with your efforts to encourage excellence toward one another. Selfish sadness over missing your podcast presence (no more Puppy Talk?!) aside, congrats on making a difficult move that, it sounds like, in your heart, you knew it was time to make. A lot of people would resign themselves to the familiarity of the status quo until retirement. Whatever your next adventure ends up being, I’ll be wishing you all the best (just so long as you continue to tweet the occasional puppy picture). You deserve it. P.S. Any chance you’ll still be at PAX East this year as a civilian? Would love a chance to offer to buy you a drink or, if that’s too random-dude-from-the-Internet-creepy, just say hi and thanks in person. May you find what you are looking for Stepto and hopefully you’ll stop in from time to time and update us with your journey through the Podcast team. It is a shame that you couldn’t find a different role within Microsoft to fullfill your career ambitions. I would think they would work with you to keep such a valuable member in their workforce. I’ve really enjoyed you insight in the Podcast over the past year or two. You’ll be missed. Best of luck and smooth sailin’. I’d say you’ll be missed, but something tells me you won’t be entirely gone. As far as your fans are concerned, you’ll probably have just moved from over here to over there. I know I’ll be watching stepto.com to see what you’re up to next. Things change and grow and I wish you nothing but success and happiness in the next chapter of your story. Pingback: Director of Xbox Live policy and enforcement to leave Microsoft after 17 happy years « MonkeyLoverz! Good luck in your future endevours Stepto. Really enjoyed listening to you on the Podcast for the last few years. Will be interesting to see what area of the Technology industry you will respawn into!. I hope you find another way to come into my ears! I turn 40 this year too Stepto and I think i get where you’re coming from. It’s a time for reflection, to take stock in your life up till this point and plot a new course if desired. All the best, going to miss you on the podcast. Good luck, I know well how interesting a career change can be. I will certainly miss hearing your weekly banter, but All Good Things.. Besides, what ever you end up working with next, I’ll most certainly be interesting to hear about. I will email you sometime elaborating on this, but I would like to thank you. Thank you. I first became interested in InfoSec when I listened to the podcast with Major and you, and that has changed my life. I set a goal, I strove towards that goal, and now I am living it: studying towards a degree in Security and Risk Analysis with a focus on Information and Cyber Security. I don’t know what I wouldn’t have done if I had not listened to that podcast back in 10th/11th grade. Thank you, you have been a role model to me. May the road rise up to meet you; good luck wherever you choose to go. Pingback: La strategia di Microsoft per la protezione di XBox Live dagli hacker è… chiedere aiuto agli utenti. You have done a great job humanizing your department at Microsoft by being in the ears of so many listeners, and that’s no small thing. Best of luck to you. For some reason I see you landing at Penny Arcade assuming you are staying in the Seattle area. it’s a shame that we won’t hear you again on the podcast because you are a great guy who believed in what they did. good luck for the future and i hope major lets you do guest spot at PAX or something! Stepto, i know im a little late. but i want to thank you for your service. I wish you farewell in all future projects. I’m glad to hear you’re following your heart, Stepto. I wouldn’t expect any less from an awesome gentleman such as yourself. Best of luck in your future, and thanks for everything. You’ll be dearly missed from the podcast and certainly from Xbox.